Cette maison de ville récemment rénové offre 3000 pieds carrés d'hébergement de luxe pour les grands groupes, idéalement situé pour profiter des deux activités hivernales et estivales. Votre retraite de montagne dispose de 4 chambres bien aménagées et 5 salles de bains. Les 3 chambres à l'étage ont tous de nouveaux lits king size, chaque chambre a sa propre salle de bain privée, deux suites avec maître de salle de bains. La salle de bain en bas permet de dormir au moins quatre personnes et dispose également d'une grande salle de bains moderne. Il y a un Pack N Play dans le placard des chambres à coucher. Les sièges autant que 10 personnes de la table de salle à manger; En outre, la cuisine gastronomique entièrement équipée fournit contre des sièges pour trois autres. La chambre familiale spacieuse dispose de deux aires de repos séparées et une cheminée accueillante. L'établissement propose également une salle pleine de blanchisserie, d'un garage, d'un gril extérieur avec 2 patios, et (3 sont 55 "les écrans plats, plus soundbars Bluetooth) de six TV. La technologie est abondante partout --free wi-fi, deux lecteurs blu-ray, Sony PlayStation 4, et un système de son surround! Le lotissement est parfaitement positionné à moins d'un mile de Vail Village; le système de navette fournit à quelques centaines de verges ramassage et de livraison à partir de votre porte d'entrée. Le terrain de golf est à distance de marche. Une plus grande confidentialité est assurée puisque l’installation est une unité finale sauvegardée dans la forêt nationale. What a great property. We had 5 adults and 3 kids with us.. Accommodations: Bottom floor has one bedroom with 4 beds.. this was great for the 3 boys. Big flat screen TV with PS4, although we brought our Nintendo switch.. easy to connect. Middle floor has a spacious kitchen with a large granite counter area. from appliances to cookware, anything and everything you could possible need is here. Dining area seats 10. The Living area is broken into 2 seating extremely cozy and comfortable areas, one around the TV and the other at the wood burning fireplace. The 3rd floor has three bedrooms all with king sized beds. 2 of them with ensuite baths. Beds were great and very comfortable. Cleanliness and presentation of the condo exceeded expectations. Jeff the property owners provided excellent communication before and while we were there to make sure our experience was first class. Oh, and the location was only a couple of miles from Vail Village. Much closer than it seemed on the map. Highly recommended. We will be back!! This property was warmer and more cozy than even the great photos show. Great perks of multiple modern baths, spacious kitchen with every utensil imaginable, and plenty of room for group gatherings. The owner, Jeff, was attentive to our every need, graciously checking in to make sure everything was to our liking. Bus system to lifts was ultra-reliable. Would definitely recommend this property to anyone heading to Vail area! Great place to stay at Vail!! Guys ski trip. Each guy had his own bed. Basically has three master bedrooms with bathrooms, an more twin beds with bathroom downstairs. Very clean and upscale. No problems at all. Had a great time. Owner is great to deal with! Great location, everything you need for a great week of skiing! Owners were great to work with... answered questions right away, very accommodating. The condo is less than 10 mins from Vail Village and Lionshead (by car or by shuttle). The kitchen is fully stocked, beds are comfortable, and there was plenty of space for our group of eight. Great week of skiing in Vail! Well-appointed, upscale condo conveniently located to Golden Peak and Vail Village centers. We couldn't have asked for more in this clean, well appointed and beautifully decorated townhome. It felt warm and cozy like a home. With 4 bedrooms (3 with kings and a bunk room for kids) and 5 baths this unit is excellent for both couples or families. The updated kitchen has everything you need.The owners were very responsive and helpful to ensure we had a great visit. 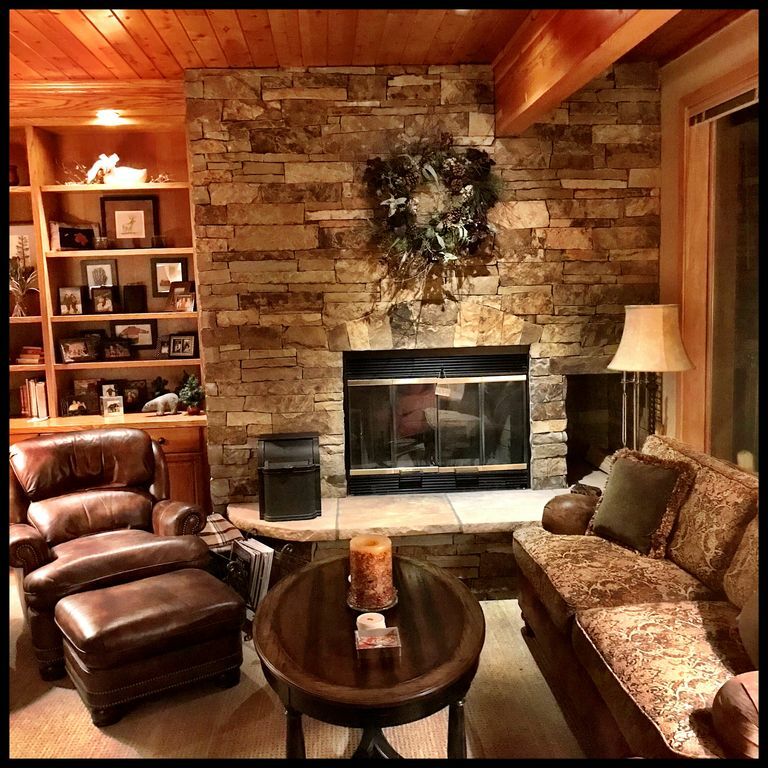 The unit is conveniently located just over 1 mile from both Golden Peak and Vail Village lifts for ski season. It is also a short walk to the bus route. We enthusiastically recommend staying here! We would definitely rent again! Our family spent the Christmas Holiday in Vail. The owner provided necessary, detailed information regarding the property: location, heating suggestions, and use of TV/WiFi. This made entering and enjoying the home very easy. The location is about 10 minutes from Vail Village for ease of shopping, dining and skiing. The actual house is everything the photos depict. Very upscale, easy to enjoy and quite large. We had a big group over for drinks, dinner and games for the holidays. It was easy to entertain from the large, well equipped kitchen to the blazing fireplace to relax and enjoy the company. I cannot think of a single item to critique or improve upon. Maison de ville est situé à 1 mile de Vail près de la Vail Golf Course. Il est à environ 300 verges de l'arrêt de bus gratuit.